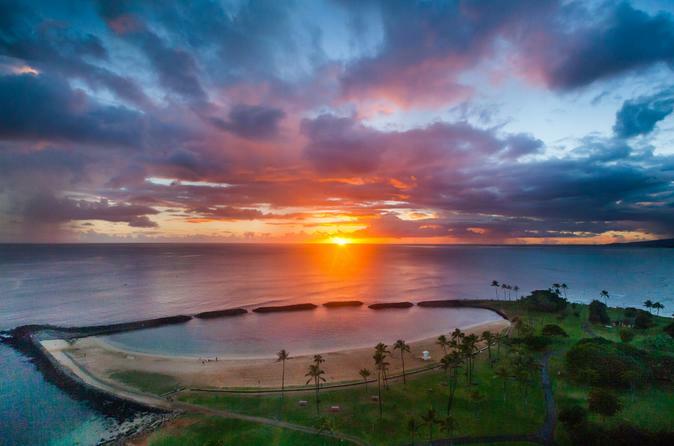 The sunset over Waikiki is Oahu's most awe inspiring show. This exclusive Sunset Helicopter tour gives you a front row seat to this brilliant spectacle. The Oahu sunset is Nature’s Grand Ceremony and from your guaranteed window seat you get to witness Oahu's most impressive natural wonder. Your helicopter flies past Honolulu's skyline as the evening light bathes it in brilliant reds, oranges, yellow. After passing above Waikiki beach, you will fly above Diamond Head to see the shadows reach beyond the peak and into the ocean deep beyond. As you pass back into the city, you will see the disappearing sun highlights the skyscrapers in spectacular light. Flying back towards the city, you’ll witness as the waning sun emblazons the sky and silhouettes the expansive city skyline against gorgeous hues of pink, orange, red, and yellow. As the sun dips below the horizon and the blue sky becomes dark, your flight continues to Pearl Harbor for a twilight pass of the USS Arizona Memorial and an end to another perfect day in Hawaii.